Tropical cyclones in the Bay of Bengal (BoB) are the major source of loss of properties and lives in the adjacent coastal regions during post-monsoon (October–November) season. This study explores the impact of large-scale environmental change on tropical cyclone (TC) Phailin (2013) in the Bay of Bengal. An ensemble simulation with a regional atmospheric model using different physics and initial conditions is able to capture the observed track of Phailin. The cyclone intensity, however, is underestimated due to the coarse resolution (10 km) of the model. 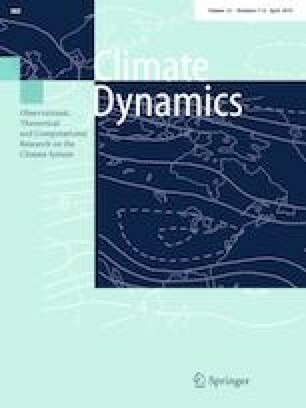 To explore Phailin’s response to a warming climate, a global climate model change signal is added to the cyclone environment using the pseudo-global warming approach, and the ensemble is run again. It is found that changes in the track of Phailin would be small, except around the time of landfall, when Phailin shifts southward in its track. The cyclone becomes more intense and larger, but the translation speed remains nearly unchanged. An analysis of physical processes indicates a deeper TC core due to enhanced latent heating. The vertical distribution of temperature and wind indicates that the eye of Phailin would have a greater vertical extent in the future climate. The expanded size is found to be due to an increase in environmental humidity and temperature in the lower-troposphere leading to an increase in environmental convective available potential energy. The translation speed remains nearly unchanged due to insignificant changes in the steering flow. The result suggests that Phailin, under a warmer climate, may have higher damage potential (~ 22%) compared to the present at the time of landfall. The data for future climate simulation was obtained from http://rda.ucar.edu/datasets/ds316.1/. We thank three anonymous reviewers for their insightful comments that resulted in significant improvements in the paper. We thank Chris Combs for editing an earlier version of the paper.